We’d love your help. Let us know what’s wrong with this preview of The True Adventures of Nicolo Zen by Nicholas Christopher. A richly detailed historical novel from master storyteller Nicholas Christopher that School Library Journal calls “[A] lush tale of music, magic, and intrigue”! Nicolò Zen is all alone in 1700s Venice, save for his clarinet, which a mysterious magician had enchanted, allowing its first player to perform expertly. Soon Nicolò is a famous virtuoso, wealthy beyond his drea A richly detailed historical novel from master storyteller Nicholas Christopher that School Library Journal calls “[A] lush tale of music, magic, and intrigue”! Nicolò Zen is all alone in 1700s Venice, save for his clarinet, which a mysterious magician had enchanted, allowing its first player to perform expertly. Soon Nicolò is a famous virtuoso, wealthy beyond his dreams, but he can’t stop wondering if he earned the success himself—or what might happen if the spell were removed. And throughout it all, he continues to think about the girl he met in Venice, what she might be doing and if she’s safe from harm. To ask other readers questions about The True Adventures of Nicolo Zen, please sign up. Christopher has such an evocative way of describing surroundings and garments - it's something I particularly loved about Veronica and A Trip To The Stars as well. The story itself is not particularly innovative, but it was perfectly transporting, and allowed me to forget my worries about the rest of the world for a day or so. Montana Library 2Go | ultimately unsatisfying | something about the pacing, or possibly where the author placed his focus, just let me down. I felt like little was truly happening, and what did happen was mostly through coincidence or someone else taking the reins of the protagonist's life. I loved it. Reminiscent of Veronica. A quick read. Not too much magic, but enough to make it enjoyable. A happy ending. Oddly, this book reminded me of a shoujo manga (La Corda d’Oro) that I was sort of obsessed with for a while, despite the fact that it was absurd and based on a romance video game. Whatever. So in this series, a fair of music gifts a girl a magical violin and enters her in a competition with the most skilled music students at her school. The violin basically makes her a prodigy. This same basic premise is For more reviews, Cover Snark and more, visit A Reader of Fictions. his difficulties. He is auditioning for a place in an orphanage, the Ospedale della Pieta, which has an orchestra of children. An orchestra of all girls. So Nicolo is now dressed as a girl and the Master who accepts him into the orchestra is Master Antonio Vivaldi. How long can he keep his two secrets? What would be the cost of discovery? The story also has a few fine villains, some magic and magicians, some loyal friends and a bit of luck. The real question is, however, whether the clarinet will become part of Faustian bargain that will claim his soul. 14-year-old Nicholas Zen is a gifted musician with an enchanted Clarinet, but in 1714 Venice, the newly invented instrument is uncommon. Recently orphaned, and disguised as a girl, he is admitted to the elite girl’s orchestra at the Ospedale in Venice, under the direction of Master Luca. But, when girls start disappearing, can Nicolas keep his identity secret? This historical fiction is a nice travelogue of major European cities, and the action is well written and exciting, however it often gets 14-year-old Nicholas Zen is a gifted musician with an enchanted Clarinet, but in 1714 Venice, the newly invented instrument is uncommon. Recently orphaned, and disguised as a girl, he is admitted to the elite girl’s orchestra at the Ospedale in Venice, under the direction of Master Luca. But, when girls start disappearing, can Nicolas keep his identity secret? This historical fiction is a nice travelogue of major European cities, and the action is well written and exciting, however it often gets lost in the descriptions which slows down the story, has a few anachronisms (matches in 1714?) and the magical elements feel forced. This opened with a bang, but didn’t deliver. This took me just a couple of days to read, but it's incredibly forgettable, which is too bad because it has a lot of elements that could've been great. 17th Century Europe, music, magic, orphans, romance, intrigue, etc etc. But it just feels unfinished/undeveloped. It reads like a barely fleshed-out outline of a plot. I'm all for well-edited YA fiction, but there's a lot of "this happened, then this happened, then this happened, then this happened..." and it's hard to care about Meh. Meeeeeehhh. But it just feels unfinished/undeveloped. It reads like a barely fleshed-out outline of a plot. I'm all for well-edited YA fiction, but there's a lot of "this happened, then this happened, then this happened, then this happened..." and it's hard to care about much of it. The intriguing magicians don't get to do much but be mysterious deus ex machinas, and the baddies are just bad (with no nuance), and there's a TON of telling-not-showing. The magical clarinet is a great plot point, a wonderful set-up, and then NOTHING HAPPENS WITH IT. I really liked this book, but I may be a bit impartial seeing that I am a violinist. I thought it was interesting to get a little bit of background on the clarinet in the book, which I didn't even think about being new at the time. I am also a history nerd, so the settings in historical Europe were so interesting to me. Plus, the little throw in of magic I like. Hey, who doesn't want a little bit of fantasy in their life? I can see where the author could've put in a little more character develop I really liked this book, but I may be a bit impartial seeing that I am a violinist. I thought it was interesting to get a little bit of background on the clarinet in the book, which I didn't even think about being new at the time. I am also a history nerd, so the settings in historical Europe were so interesting to me. Plus, the little throw in of magic I like. Hey, who doesn't want a little bit of fantasy in their life? Just finished reading The True Adventures of Nicolo Zen by Nicholas Christopher. I love his adult books, and this was his first stab at middle grade fiction. It features an orphan in 1700s Venice who has a magical clarinet and winds up travelling to Vienna and other parts of Europe. It should have been right up my alley, but while it was very well written the story just fell flat for me. I didn’t care much for the characters and thought the clarinet was underutilized in the plot. 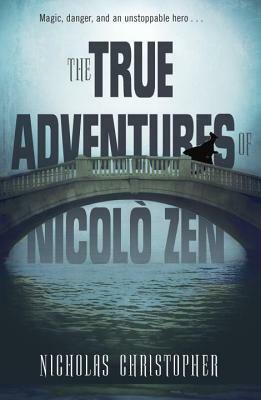 A big missed op Just finished reading The True Adventures of Nicolo Zen by Nicholas Christopher. I love his adult books, and this was his first stab at middle grade fiction. It features an orphan in 1700s Venice who has a magical clarinet and winds up travelling to Vienna and other parts of Europe. It should have been right up my alley, but while it was very well written the story just fell flat for me. I didn’t care much for the characters and thought the clarinet was underutilized in the plot. A big missed opportunity. So this one gets 3 stars. Nicolo is left to his own devices after the plague has left his entire family dead. He goes to Venice to try to make his way there. He has a magic clarinet in his possession, and he wants to get into an orchestra. Luckily, there is an orchestra made of of orphaned children. Unfortunately, it is only for girls. Nicolo is young enough that he can pass for a girl, but how long will his charade work? Like reading a biography of Mozart where magicians come out to play. Nicolo Zen is a recently orphaned venetian boy whose only possession is a magical clarinet that only he can play. After disguising himself as a girl in order to join an orchestra made of up of orphans, his adventures really begin. The kind of off-kilter, slightly sinister magic you might remember from The Night Circus, but also a compelling portrait of Venice and Vienna in the early 18th century. This book started out with such promise but then just lost it halfway through. I plodded on and on and kept thinking of the question "Why did you finish this book?" My answer to myself was that I initially planned on reviewing it for our Teens Read blog. As I slogged on and on I knew that wasn't an answer I wanted to give. So I skimmed the rest of the book and change my scheduled review! Too bad! I really liked the idea of a magical clarinet! fun read but nothing special. really love this author's writing, which was still good here, but something was just a little off / lacking in depth that i usually expect at this point. it was also very short. main character was interesting though and the almost present telling of the story was also good. i would recommend but not as a front runner. The imagery and quirky characters were well done. I especially wanted more on the slightly weird and extremely talented magician. The premise of the book, however, is better suited to a novel for grown ups instead of YA. I think students will have difficulty swallowing the minimal history used to set the tale as well as the broad leaps between dangerous situations. Part fantasy, part historical fiction, with a clarinet-playing boy as the main character. It is certainly an original story! Some of the content was more mature than I would want my 10 year old to read, but the musical intrigue was compelling. I also enjoyed the role of the Vienna orphanage for musical girls and the character of Vivaldi, since that is a fascinating part of music history. Other Cristopher favorites include: Veronica and A Trip to the Stars. Another lovely bit of American Magic Realism from Nicholas Christopher. This is probably my third or fourth favorite of his novels, but that is actually high praise. I was somewhat disappointed by the abrupt and too-neat conclusion, but I enjoyed all of the parts of the story for their own sake. I really enjoyed this book. Nicolo's journey was action packed and I loved the bit of fantasy/magic that Mr. Christopher added. Mr. Christopher's writing style is wonderful and he really creates a setting that makes the story believable and easy to follow. Had its moments-- a boy pretending to be a girl so he could get into a girls' orphanage in Venice after his family dies of malaria-- and the enchanted clarinet is intriguing, especially since the clarinet is fairly new at the time, but I just can't think of any of my students who would read this. Interesting idea of putting the (enchanted) 'first' clarinet in its historical setting. It is refreshing to read of a boy who 'makes it big' and is still good-hearted after he has the means to pay back those who had helped him in the past. This is one of those underrated books that are simply delightful and inspiring. Read more from The Page Walker. Rich imagery, magical realism with historical facts. Not for everyone but I thought it was great.